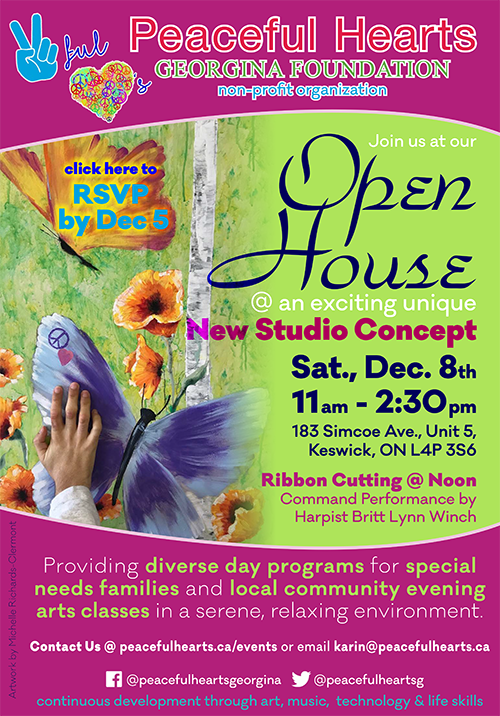 183 Simcoe Ave Unit #5 Keswick, ON L4P 3S6 Contact: Karin Cacciola Phone: 905-535-LOVE (5683) New studio concept open house and ribbon cutting. Peaceful Hearts provides diverse day programs for special needs families and local community evening arts classes in a serene, relaxing environment for it’s patrons. A command performance by Harpist Britt Lynn Winch will also be here to provide entertainment.